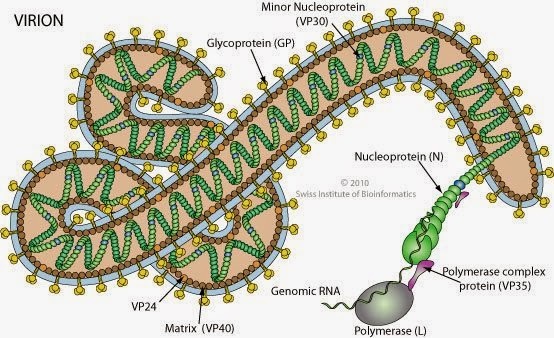 The much-talked about Ebola virus is an encapsulated single-stranded (ss) negative RNA virus belonging to the family Filoviridae. In this article, we review the structure of the virus and the known function of its components to understand the virus’ life cycle and pathogenicity in humans. Electron microscopy studies show that the Ebola virus has a filamentous appearance typically 800 nm long and 80 nm in diameter. Each viral particle or virion consists of a nucleocapsid consisting of the negative ssRNA genome surrounded by the nucleoprotein NP, the polymerase cofactor VP35, the virus specific transcription activator VP30, and the viral RNA polymerase L proteins (Fig 1). This nucleocapsid is encapsulated by an outer viral envelope originating from the host cell membrane with characteristic 10 nm long viral glycoprotein (GP) spikes. The matrix between the outer viral envelope and the nucleocapsid is occupied by the VP40 and VP24 viral proteins1. from host cell membrane (in light blue) and is studded with viral GP spikes (yellow studs). The virus genome is 19 kb in length, and encodes seven structural and one non-structural protein. Figure 2 below shows the virus genome with the gene order. Fig 2: Diagrammatic representation of the Ebola virus genome. The viral RNA polymerase binds at the leader end to initiate sequential transcription of each gene. The newly transcribed mRNAs are capped and polyadenylated by the L protein during this process. Of note, the primary mRNA transcribed from the GP gene encodes a small, non-structural, soluble protein called sGP which is secreted from the infected host cells into blood. The fully functional glycoprotein is a result of RNA editing and this protein is expressed on the cell surface as GP spikes2. These GP spikes, help in anchorage and membrane fusion of the virion to the host cell, and are a crucial factor for Ebola virus pathogenicity. The matrix protein VP40 is important for maintaining the structural integrity of the virion. It is also associated with endocytosis and virus budding and has the ability to release itself from the cells even in the absence of other viral proteins3. The second matrix protein VP24 suppresses interferon production in the host cell4. In addition, VP24 is also important for the correct assembly of a functional nucleocapsid along with VP35 and NP proteins5. The remaining proteins namely NP, VP35, VP30 and L proteins form the structural components of the nucleocapsid. Moreover, these proteins also catalyse genome transcription and replication5. It is not entirely known how Ebola spreads in humans, but contact with body fluids of infected humans or animals is primarily responsible for the virus outbreak. Fruit bats are the natural reservoirs of the virus. The US Centre for Disease Control has a self-explanatory cartoon depicting the likely method of virus transmission from bats to humans (Fig 3). 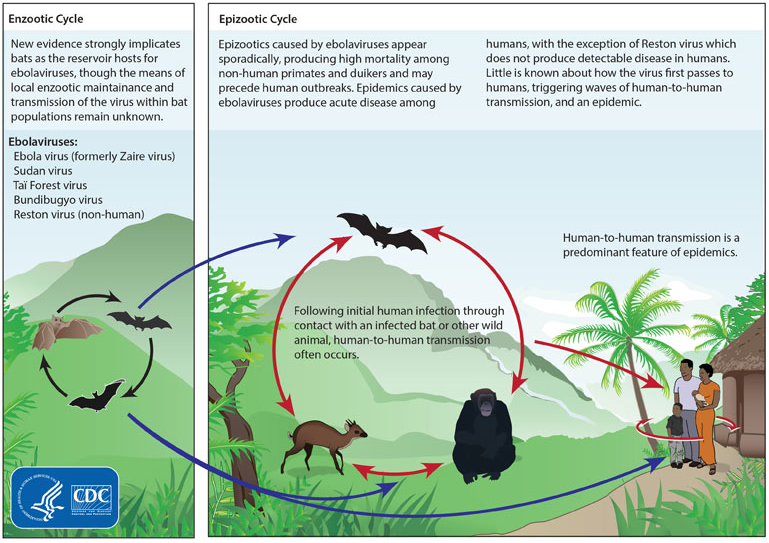 Figure 3: Ebola virus transmission from fruit bats to humans. The early targets of the virus are the monocytes and the macrophages of the host immune system. Other target cells include dendritic cells, liver cells, and endothelial cells. Ebola virus employs different mechanisms to interfere with or even ignore the host immune system completely. Most of these host immune system attack processes involve the virus’ structural proteins. One such mechanism is called the antibody-dependent enhancement (ADE) wherein the host antibodies (Abs), facilitate or enhance the virus’s attachment to the host cells increasing infection in these cells. The Abs bind to antibody receptors at their Fc sites while the virus binds to the antigen-binding site at the free end of the Abs6. In vitro studies in Ebola showed that the virus activates the classical pathway of the complement system. Initially, the Ebolavirus binds to its receptor on the host cell surface. Following this, Abs bind to the glycoprotein (GP) spikes of the virus, and the C1q component of the complement system binds to the Ab-GP complex. The C1q component enhances the Ab-GP complex to bind to C1q ligands on the host cell surface thus increasing the interaction of the virus with its receptor on the host cell surface. This way, the GP spikes on the virus use the host immune system (Abs and the complement components) to enhance its attachment to the target cells7. In addition to ADE, the virus’ protein VP35, blocks the immune system’s interferon (IFN) pathways comprising of various cytokines that exert anti-viral responses. VP35 blocks IFN response by competing with the proteins such as retinoic acid-inducible gene 1 (RIG1) protein to activate the IFN pathway8. Along with VP35, VP24 also blocks IFN pathway activation. VP24 blocks transcription factors like STAT1 that regulate transcription of the immune system genes4. As aforementioned, the primary mRNA transcript of the GP gene encodes the soluble sGP which is speculated to have an anti-inflammatory role during infection which further enhances the virus’ escape from host immune system response. Moreover, sGP has many similar epitopes with GP, so it could potentially sequester or absorb host Abs to block their downstream action9,10. Thus, the viral proteins disrupt different components of the immune system to attach to the host cell for subsequent entry. The exact mechanism by which the Ebola virus enters host cells remains poorly understood. One general mechanism to infect host cells for most enveloped viruses including the Ebola virus is endocytosis. Research indicates that the virus utilises a lipid-dependent, non-clathrin and dynamin-independent endocytic pathway of entry. Macropinocytosis is the most likely mechanism employed by the Ebola virus11. This process involves outward extensions of the plasma membrane formed by actin polymerization, which can fold back upon themselves. The distal loop ends of these extensions or membrane ruffles can fuse to form a macriopinosome. This also means that actin and its associated polymerising proteins play a pivotal role in virus entry. The exact mechanism by which the virus induces macropinocytosis is not understood. It is speculated that interactions between GP and host cell surface receptors can trigger macropinocytosis to initiate viral entry11. Once inside the host cell, the virus initiates transcription at the leader end of the genome with the binding of the polymerase complex5. VP30 is an important transcription activation factor for viral genome transcription, while VP24 is an inhibitor to this process. The exact mechanism of VP24-dependent transcription termination is not fully understood, but it seems to be important for converting the virus from its transcriptional or replication active form to one that is geared for virion assembly and exit from host cell12. Following replication, the cell loses its connection with other cells as well as attachment to its substrate. Meanwhile, the newly synthesized genomes are packaged into new buds or virions and egresses from the host cell surface with the help of the matrix protein VP40. VP40 interacts with ubiquitin ligase Nedd4 which is a part of human ubiquitination enzyme pathway and links multiple copies of ubiquitin molecules to VP4013. VP40 itself is transported to the host cell plasma membrane using the COPII transport system14. Once in the plasma membrane, the virus moves through lipid rafts where the final assembly and budding of the virions occur, before their final exit from the host cell. Although the structural components of the virus are known, the exact mechanisms by which it causes disease in humans are not completely understood. This poses a major challenge for treatment and to date prevention is the best mode of action to avoid an Ebola outbreak. In the next article, we will review the prevention, treatment and prognosis for the disease and known measures to restrict further spread and recurrence. Belum ada Komentar untuk "Siklus Hidup Virus Ebola dan Patogenesisnya"